Do you have a tree or hedge problem? Perhaps you have a conifer hedge (usually leylandii) that needs reducing in height and tidying up; a big garden hedge that needs clipping or your garden is shaded by large trees that need either a crown reduction or crown lifting, or trees that need removing altogether because they are too big or in an inappropriate place. We will arrange a site visit to give an estimate and professional advice. We don't charge a fee for this service and will say if we feel that nothing should be done! Our quotation will include dealing with any planning procedures that are applicable. 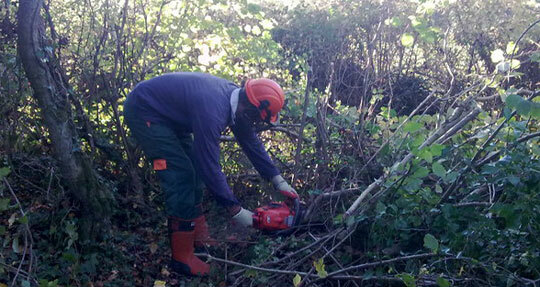 We provide a service on commercial properties, like this sycamore removal at an Elf service station. We are happy to enter into long term maintenance contracts. We are also very happy to work for private customers. This large conifer was felled to provide more light to the house. On the right, a customer's husband and children tried to remove an old apple tree stump by burning it out. It didn't work! 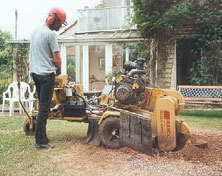 We were able to rush in with our stump grinding service and save the day! We have planned and carried out planting schemes for private individuals, wildlife trusts, schools, farmers, the Duchy of Cornwall, community groups, commercial premises and local authorities. We also offer an ongoing maintenance contract (spray weeding, mulching and replacement of losses) to ensure the trees reach maturity. A recently coppiced compartment in an ancient woodland, where hazel is cut on a regular rotation underneath oak. The hazel re-grows to provide a continuous resource. The increased light allows spectacular displays of bluebells to bloom in the spring. If you have tree work in mind, do give us a call on 01225 840080 or 07768 721 131 and our team of experienced tree surgeons will be happy to advise.